THE Nigeria Police Wednesday, explained that Senator Dino Melaye, who was earlier arraigned at the Chief Magistrate Court, Wuse for criminal conspiracy and other charges, was re-arrested to immediately face another criminal charges against him in Lokoja, Kogi State. 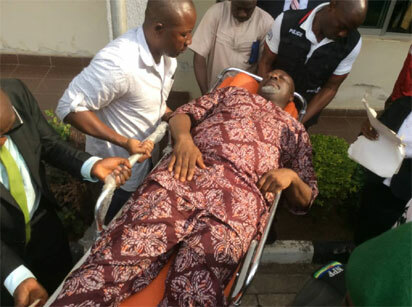 The Force Headquarters, in a statement to this effect, by its spokesman, Jimoh Moshood, said Melaye who it said, has been certified feat from the National Hospital Abuja, where he was admitted earlier, would be immediately taken to Lokoja for subsequent arraignment in court there. “Senator Dino Melaye was arraigned in court by the Police today, 2nd May, 2018 at Chief Magistrate Court, Wuse, Abuja for Criminal conspiracy, causing damage to Government property, attempted suicide and escape from lawful custody. His arraignment in Court today was subsequent to his discharge from the National Hospital after he was confirmed fit for trial. ” It will be recalled that, on the 24th April, 2018, at about 1200Hrs, Sen. Dino Melaye while in lawful custody of the Nigeria Police Force and being taken for arraignment for Conspiracy and Unlawful Possession of Prohibited Firearms in Court in Lokoja, from Abuja, escaped from lawful custody when hoodlums and miscreants in Two (2) Toyota Hilux Vehicles blocked the Police vehicle conveying Senator Dino Melaye around Area 1 Round About, Abuja and in the process the Senator broke the side glass of the vehicle and jumped out of the Police bus through the window and was rescued from the Police men by hoodlums and miscreants to an unknown destination before he was rearrested at Zankli Hospital in Abuja later in the day on same date.